Like many other experienced investors, I appreciate the value of a high-quality insurance operation. Berkshire Hathaway is the gold standard in this industry from an investment standpoint and the recent 50th anniversary shareholder letter was widely commented on throughout the financial realm. It’s not as if the Berkshire family of insurers are the absolute greatest underwriters in the world. They simply have such grand size and scale in combination with enough discipline to continually underwrite at a profit which continues to provide Warren and Charlie with a ridiculous level of float to continue their intergalactic wheeling and dealing. Yeah, I said intergalactic, as in, Berkshire’s about to close a deal for part ownership of Ganymede, Jupiter’s largest moon. Rumors are swirling that Lemann and the boys at 3G will front most of the capital while Warren obtains the preferreds on the newly discovered salt-water bodies. Much ballyhoo is paid to Buffett and deservedly so, however, Prem Watsa who is his much smaller counterpart up in Canada also provides a must-read annual shareholder letter. Watsa runs Fairfax Financial which has long been considered a “Baby-Berk” and you can scour the web to find countless articles on them. I’m not writing today to conduct a deep-dive on Fairfax. Feel free to dig into their old letters and annual reports for that. I just wanted to share a little content from Watsa’s most recent shareholder letter in light of all the press that W.B. and C.M. received for Berkshire’s. Watsa is a well-respected value investor who is often criticized for his asset allocations but he almost always has the last laugh. Watsa’s letters are filled with quality analysis on current economic and market goings-on. Does he explain his whole playbook? Of course not, but he shares enough to make you consider your own stance and allocations. Many consider Watsa’s skills to be right up there with any asset manager alive. I thought I’d share what are a few important notions from his most recent letter, which was released at the beginning of March. Full disclosure, I’m a long-time and current shareholder in Fairfax Financial. Holding a stock that had a 20% CAGR in the share price over the last twenty-nine years was an easy way to become wealthy for anybody who happened to have been smart enough to have purchased shares and held them. I, unfortunately, am not one of those smart persons. Aside from all the usual valuation metrics and models for the seasoned investors to analyze, at $545/share(USD) the investing novice can pick up some shares and let Prem work his magic for hopefully another 15 to 20 years. Watsa turns 65 at the end of the summer and he’s long said he does not want to work into his 80’s, but obviously we’ll have to wait to see what the future holds. It’s very difficult for a successful business person to just hand over the reins of their babies which they’ve built from nothing. I don’t see Watsa casually walking away from Fairfax just because of age. As long as his mental faculties allow him, I see him running Fairfax. Watsa has done a brilliant job acquiring add-on insurance and reinsurance operations around the world to expand Fairfax’s international footprint. Additionally, he’s shuffled and empowered managers to tighten up underwriting standards across all lines. The result has been a significant increase in operating profits. You can see that just a few years ago, Fairfax was underwriting coverage at a loss across multiple subsidiaries. Only the discipline at their largest revenues source, OdysseyRe, allowed them to maintain a combined ratio under 100% in 2012. For any readers who are not fully aware of how profit reporting works with insurance companies, if an insurer or reinsurer has a combined ratio of 100% or higher, then the company is underwriting policies at zero profit or a loss. It’s what’s called a lack of discipline and even if the CIO has tremendous investment results, consistent underwriting at a combined ratio over 100% is a sure-fire way to insolvency. This trend in the combined ratio is a very positive development and I look forward to a consistent number in the low 90s or even 80s. Arguably, the most important component of an insurance business to analyze is the float. Watsa has been very forthcoming about Fairfax’s float levels and how the float has positively affected the company’s “cost of capital” to invest. Disciplined underwriting allows Fairfax to essentially be paid to let one of the greatest investors in North America to invest it’s capital. Observe the following chart depicting some of Fairfax’s long-term float performance. In Prem’s own words, “Our long term goal is to increase the float at no cost, by achieving combined ratios consistently at or below 100%. This, combined with our ability to invest the float well, is why we feel we can achieve our long term objective of compounding book value per share by 15% per annum. In the last ten years, our float cost us 0.3% per year – significantly less than the 3.6% that it cost the Government of Canada to borrow for ten years.” A negative number under “Cost (benefit) of float” means that Fairfax was paid to invest. That number is a return on float investment, which over the last 10 years, takes the average cost of investment capital to damn near zero. For a deeper dive on the importance of the positive carry on float, have a read of Berkshire’s most recent shareholder letter if you haven’t already. Additionally, Porter Stansberry has produced a multitude of fine analyses on the value of quality P&Cs effectively managing float. Like Berkshire Hathaway and even Markel, Fairfax has a bevy of non-insurance related public and private equity investments with the most well-known being Blackberry. You can read the entire letter or the annual report for the details on those businesses. The last part of the shareholder letter that I wanted to touch on is the equity hedges and Fairfax’s derivative book. On the surface, it would appear as if Prem’s portfolio hedging decisions have been less than successful. These are mostly non-cash losses though as a majority of these are simple write-downs and not actually realized losses, but the cumulative impairments since 2010 are substantial. However, we saw the same thing leading up to 2007 – 2008. During 2003 – 2006 while credit was flowing out of every orifice on the earth’s surface, Fairfax suffered significant unrealized losses on their hedging program. Then 2007 and 2008 came along to make Prem look like a genius. Look at those outsized gains. Watsa’s multibillion dollar winning bets paid off huge during a time when even the smartest investment players on the planet were sitting around slackjawed questioning the great existential philosophy of what it means to be an asset manager. Although the losses are primarily unrealized, it also means that Watsa may have positioned too largely and too early. Not only does the hedging program require mark-to-market revaluation but there is also the cash outlay for the payments of premiums. It is clear Watsa feels he has been exercising prudence here despite possibly underestimating the impact of central banking on the investment world. I won’t begrudge him though, because what is more important, is that Fairfax is seeing a shift in the value of their hedging program. The trend is already beginning to move upward. 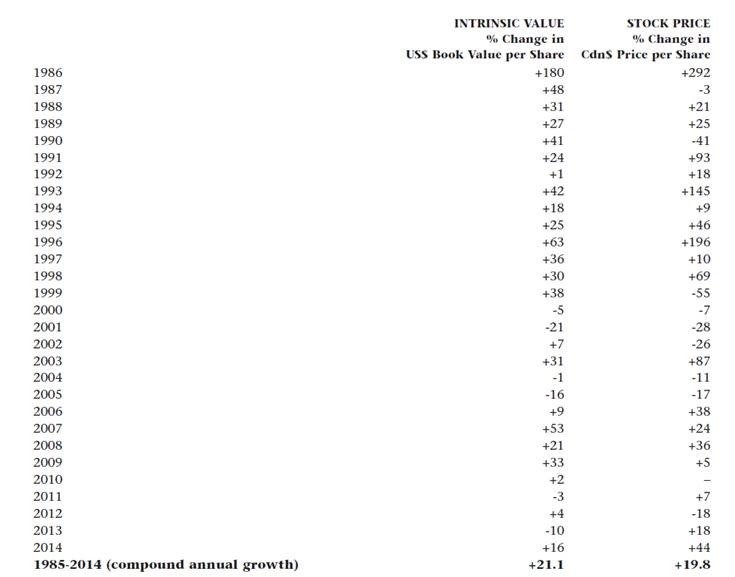 Notice how there was a slight improvement in 2013 and a doubling in value in 2014. This may be a precursor to broader market conditions as we saw the same thing leading up to the Great Recession. First, the valuation of the hedging program starts shifting positive and then the early bets pay off in spectacular fashion. It’s definitely something to keep in mind as you continue to invest in today’s markets. I would not discount the fact that Fairfax’s hedge book is beginning to increase in value. Prem Watsa has earned the respect of everybody in the world of investing. He stomped out short-selling hedge funds via the legal system back in the 00’s. He’s grown Fairfax from virtually nothing into a highly successful international insurance conglomerate. His investment results, although admittedly choppy by Watsa, are legendary due to the big scores. Have a read of the recent 20 page shareholder letter. It’s fairly easy to digest and you get a very honest assessment of Prem’s current view on the investing climate. As Munger would indirectly say; read, read, and read some more.